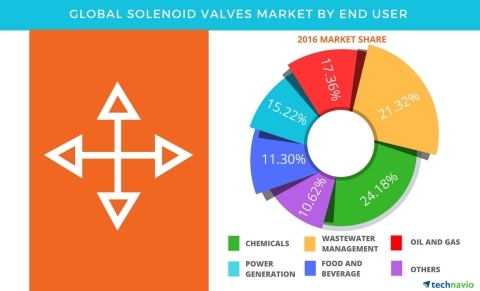 According to the latest market study released by Technavio, the global solenoid valves market is expected grow at a CAGR of almost 4%. This research report titled ‘Global Solenoid Valves Market 2017-2021’ provides an in-depth analysis of the market in terms of revenue and emerging market trends. This market research report also includes up to date analysis and forecasts for various market segments and all geographical regions. The global solenoid valves market is expected to witness a high growth during the forecast period due to the formulation of new government regulations on energy consumption and environment protection. These regulations have impelled industries to upgrade their facilities, thus creating a huge demand for solenoid valves. European and North American countries are witnessing a total renovation of many industrial and manufacturing facilities as the government regulations on sustainable development are becoming stricter. The chemical industry is the leading revenue-generating segment for the global solenoid valves market. This is attributed to the extensive need for valve control applications and strict government regulations. Solenoid valves are mainly used to control the flow of liquids and gases within pipelines, and it is very important to frequently check the conditions of the valves to prevent leakages and malfunction. Most of the developing countries worldwide are investing in water treatment plants to meet the growing demand for potable water. Many of these countries do not have an established water supply system while some are dependent on ground water. The continuous growth in population is one of the main reasons for the increasing demand for potable water. “Solenoid valves are used in water treatment plants and in pipelines to regulate water flow. The increased investment in water treatment plants and the modernization of existing plants are expected to create demand for solenoid valves during the forecast period,” says Bharath. The recent decline in crude oil prices has affected the oil and gas industry resulting in deferred investments. As on 2016, USD 200 billion worth of projects has been postponed. This industry is slowly recovering due to increase in demand for crude oil from countries in APAC. Iran and Saudi Arabia are the only two nations that did not reduce their oil production despite the decline in crude oil prices to retain their market share. Oil leakage within an industrial precinct if allowed to seep through drains will lead to water contamination. Due to several incidents of oil leakage within various industrial facilities, governments have implemented strict regulations to ensure a safe work environment and to reduce the environmental impact of such mishaps. Become a Technavio Insights member and access all three of these reports for a fraction of their original cost. As a Technavio Insights member, you will have immediate access to new reports as they’re published in addition to all 6,000+ existing reports covering segments like robotics. This subscription nets you thousands in savings, while staying connected to Technavio’s constant transforming research library, helping you make informed business decisions more efficiently.